"They wouldn't mind our being here any more than they would mind children playing on their lawns, knowing and understanding children for what they are." Times of arrogant conquest throughout our bloody history are well documented; these "missions of mercy" may spring from good intentions, leading to institutions of great value, but too often they also act as agents of great destruction and irreparable damage. Ray Bradbury�s The Martian Chroniclesis a unique work of science fiction, obviously informed by our history. It�s too bad this work has seen only one major adaptation. The thematically-rich novel reads like a detailed historical document before the fact�a prophecy of sorts that forsees our future conquests, though paved in good intentions, may lead to Hell. The Earth is dying. Spent from centuries of civilization, the need for resources is great. NASA turns to the red planet, a rock of great potential. They hope to facilitate the colonization of the �lifeless� orb, sending two expeditions, coordinated from mission control by Colonel John Wilder (Rock Hudson). Upon landing on the surface, the explorers are met by mystery. Mars is far from lifeless, containing sentient life who see the intruding humans as invaders bent on their destruction. Like humans, they fear what they do not understand, shooting first and asking questions later. The Martians� defense does not involve lasers or starfighters, but far more disturbing, psychological weapons. Both missions meet catastrophe, forcing Wilder to lead another team himself. The humans need no firepower against their alien attackers, either; the diseases of humanity brought by the first two expeditions are effective enough, killing off much of the Martian population. After landing, Wilder�s crewmate, Major Spender (Bernie Casey), seemingly falls under the control of telepathic alien survivors, who look to use the human as a tool for their revenge. Wilder must make a difficult decision, eventually leading to a Mars safe for colonization. The exodus begins, bringing people of all kinds to the red sand of Mars, including those looking for God, or merely a new beginning. Still, the faults of humanity are not eliminated by relocation, and our fallacies soon begin to manifest. Are humans destined to bring about their own destruction yet again? This made for television miniseries is divided into three parts: The Expeditions, The Settlers and The Martians. Just like Frank Herbert�s Dune, which could not be contained within Lynch�s limited film, Bradbury�s tale has a scope beyond the common blockbuster. Richard Matheson�s adapted script maintains the heart of the novel, creating an unsettling, thought-provoking world. This helps fill the void created by poor, garage-made spaceship effects and wide-lapeled space suits. At times, the late 70s visuals laughably distracted me from the issues Bradbury is exploring, but some are very striking and effective; Martian hovels are given ethereal life though heavy use of dry ice and reddish filters. Hudson is somewhat miscast here, not quite exuding the level of sharp leadership I would like to see in such an alien frontier. He seems downright uncomfortable at times. The rest of the cast offers little help, but the Martians� look is most memorable. They have a lithe nobility about them that shows through what must be uncomfortable makeup. I certainly wouldn�t call this a definitive adaptation of Bradbury�s work; there is too much dating in the visuals and not enough quality performances to make this the final word in the Chronicles. Still, this is another fine example of the miniseries format working to the benefit of the source material. The limited budget gives it a kind of charm; this is pretty cheesy sci-fi, but it�s downright fun and wears its heart on its sleeve. Bradbury�s cautionary tale of colonization speaks to our failure to learn from past mistakes. Until a drastic evolution of human nature comes to pass, some places are better off without us. Image Transfer Review: MGM�s transfer is well done. The image is relatively free of grain, showing bold, solid colors and good contrast. Despite a soft appearance, detail is relatively good. Digital overenhancement is not a major issue, but there are some minor jaggies that appear around moving objects from time to time. A surprisingly clean presentation. Audio Transfer Review: The monaural audio is very quiet. You�ll have to crank up the receiver to hear this one. Dialogue is front and center, with the Twilight Zone-like sound effects and score rarely making themselves known. Effective, but nothing outstanding. Extras Review: MGM has split the mini series over two dual-sided, single-layered discs. Each side of Disc One contains an episode. The final installment is contained on one side of Disc Two, which has a blank side with no label art. I do wish some material on Bradbury was provided to fill up that empty space. The cover art is pretty snazzy, though. 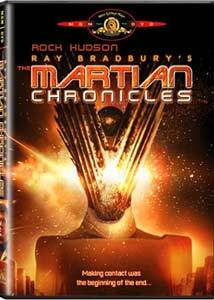 The Martian Chronicles remains the most ambitious translation of Ray Bradbury to the screen. Its source material is strong, as is its script. If you can swallow some dated cheese, this is an expedition worth taking.